"A delicious salad for cheese lovers. It is also quick and easy to throw together." Chop tomatoes in half, then slice finely; arrange on four plates. Trickle a tablespoon of olive oil over each serving, and sprinkle with black pepper. Lay slices of cheese over tomatoes, and strips of basil over cheese. Cover with plastic wrap, and refrigerate for 30 minutes before serving. 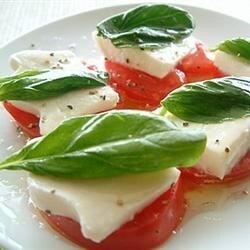 Although this is called "Owens Mozzarella and Tomato Salad" most people are familiar w/ the name Tomato Caprese. We served this w/ basil pesto on the side. Will post a picture. Also known as insalata caprese. Definitely throw in some balsamic vinegar and fresh cracked black pepper. Use the best quality olive oil you can. I added 2 tbs. of balsamic vinegar. It was delicious.